U.S. military commanders are preparing to inject 20,000 troops into the war in Afghanistan. The U.S. is preparing to pour at least 20,000 extra troops into southern Afghanistan to cope with a Taliban insurgency that is fiercer than NATO leaders expected. The new troops will augment the 12,500 NATO soldiers — mainly British, Canadian and Dutch — in what amounts to an Afghan version of the surge in Iraq. New construction at Kandahar Air Field foreshadows the upcoming infusion of American power. Runways and housing are being built, along with two new U.S. outposts in Taliban-held regions of Kandahar province. And in the past month the south has been the focus of visiting U.S. and other dignitaries — Sen. John McCain, Defense Secretary Robert Gates, U.S. congressional delegations and leaders from NATO headquarters in Europe. For the first time since NATO took over the country in 2006, an experienced U.S. general, Brig. Gen. John Nicholson, is assigned to the south. He says U.S. Gen. David McKiernan, NATO's commander in Afghanistan, has made the objectives clear in calling the situation in the south a stalemate and asking for more troops, on top of the 32,000 Americans already in Afghanistan. "By introducing more U.S. capability in here we have the potential to change the game," Nicholson said. The Army Corps of Engineers will spend up to $1.3 billion in new construction for troop placements in southern Afghanistan, said the corps commander in Afghanistan, Col. Thomas O'Donovan. Violence in Afghanistan has spiked in the last two years, and Taliban militants now control wide swaths of countryside. 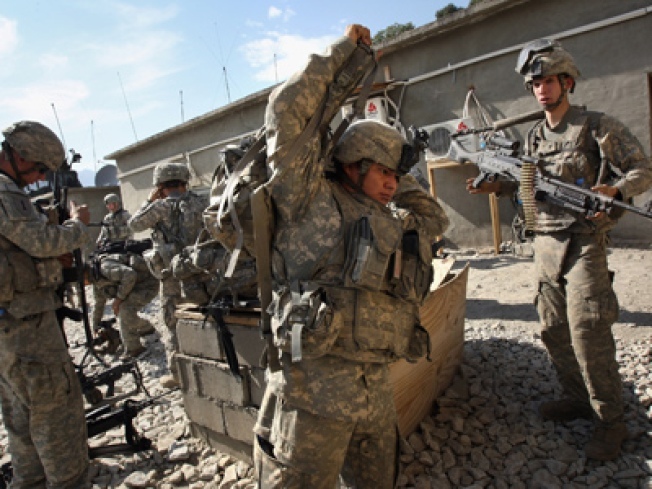 Military officials say they have enough troops to win battles but not to hold territory, and they hope the influx of troops, plus the continued growth of the Afghan army, will change that. U.S. officials hope to add at least three new brigades of ground forces in the southern region, along with assets from an aviation brigade, surveillance and intelligence forces, engineers, military police and Special Forces. In addition, a separate brigade of new troops is deploying to two provinces surrounding Kabul. Adm. Mike Mullen, chairman of the Joint Chiefs of Staff, said last month that Afghanistan could get up to 30,000 new U.S. troops in 2009, depending on the security situation in Iraq. Col. Greg Julian, a U.S. military spokesman, said Monday that one ground brigade should arrive by spring, a second by summer and a third by fall. Nicholson said he expects the U.S. forces to be deployed in Kandahar city and along vital Highway 1, which links Kandahar to Kabul, and in neighboring Helmand province, the world's largest producer of opium poppies for heroin. NATO forces are well positioned in three key areas of northern Helmand, said British Lt. Gen. J.B. Dutton, deputy commander of the NATO's Afghan mission. "What we have not yet achieved is to join those areas up, so there is a security presence that allows locals to drive safely between those areas. That's the sort of thing we are going to want to improve," he said. Since 2006, the U.S. has concentrated its forces in eastern Afghanistan, along the border with Pakistan, while the south is policed by 8,500 British troops, 2,500 Canadians and 2,500 Dutch. Their overall commander is Dutch Maj. Gen. Mart de Kruif — who would also have command of any incoming U.S. forces in the south next year. By the fall of 2010 the top officer in the south will be American. The infusion of U.S. power risks Americanizing a war that until now has been a shared mission of 41 coalition countries. But Dutton, the British general, suggested there was no choice. "It has to do with national capacity and a number of political considerations in those countries," he said. In Canada and many European countries, governments face low public support for keeping troops in Afghanistan combat zones. Dutton said the British contribution is "significant," as well as that of Canada, which he noted has lost more troops per capita in Afghanistan than any other nation. Nicholson, the U.S. general, said the Canadians have fought "heroically" but simply don't have enough forces to secure all of Kandahar. The Canadian Embassy declined to comment. More U.S. troops — 151 — died in Afghanistan in 2008 than any of the seven years since the invasion to oust the Taliban, and U.S. officials warn violence will probably intensify next year. "If we get the troops, they're going to move into areas that haven't been secured, and when we do that, the enemy is there, and we're going to fight," said Nicholson, who spent 16 months commanding a brigade of 10th Mountain Division troops in eastern Afghanistan in 2006 and 2007. That fighting should eventually clear the way for security and governance to take hold, he said. "If you want to summarize that as it's going to get worse before it gets better, that's exactly what we're talking about," he said.